For the ultimate in care and detailing of fine wheels & tires! Perfectly detailed wheels & tires are a compliment to any automobile. 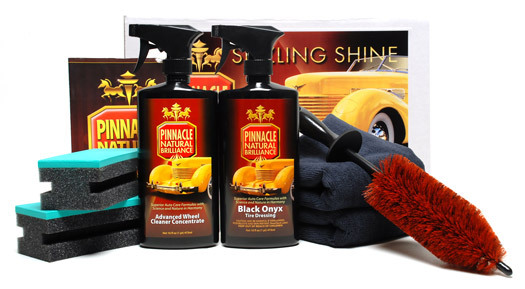 The Pinnacle Concours Wheel & Tire Kit is an inclusive kit designed to clean your wheels and dress your tires with the finest detailing products available. To make cleaning even the most intricate wheel designs easy, a Speed Master Jr. Wheel Brush is included. Pinnacle Black Onyx Tire Dressing dresses your tires to a rich, deep black finish that is the final compliment to any highly detailed automobile. Each application of Pinnacle Black Onyx Tire Dressing coats your tires in a great looking, highly protective coating. Tires treated to Pinnacle Black Onyx Tire Dressing will retain that rich black finish for several weeks, even when exposed to inclement weather. The Speed Master Jr. Wheel Brush is the most advanced wheel detailing brush today! Built for quick, effective cleaning of the tightest areas, the Speed Master Jr. Wheel Brush has a state-of-the-art design that cleans any wheel surface and any wheel design � without scratching! Brake dust beware! There's nowhere to hide, even in the smallest areas, the Speed Master Jr. Wheel Brush is a must-have in tool to properly clean your wheels. Less mess is the goal when it comes to applying tire dressings. Flex Foam Tire Dressing Applicators feature Flex Foam Technology� which hugs the curve of the rubber to apply an even coat of tire dressing with no drips or pooling. Each applicator is 5 x 2 inches. The open-cell, gray foam absorbs excess tire dressing to prevent drips and pooling around letters. However, the foam has very small, dense cells to keep the tire dressing near the surface, rather than soaking entirely into the foam. Flex Foam�s density reduces product waste and provides even, thin coverage of tire dressings. The foam is indented on each side to provide a place to grip the pad. Begin by rinsing your wheels and tires with a steady stream of water to remove any loose soil. Simply spray Pinnacle Advanced Wheel Cleaner Concentrate onto your tires and wheels. Use a gentle brush on wheels and a tire brush on the rubber to agitate the surfaces. Clean hard-to-reach areas such as between and behind the spokes with the Speed Master Jr. Wheel Brush. Agitation breaks the bond between the wheel or tire surface and the pollutants. No hard scrubbing is required! Rinse thoroughly with a jet of water. For best results apply Pinnacle Black Onyx Tire Dressing after the wheels and tiers have dried completely. Spray Black Onyx Tire Dressing directly onto the tire or onto the included Flex Foam Tire Applicator. Spread evenly over tires. Wait 15 minutes between additional coats. A total retail value of $92.95. You save $22.96!